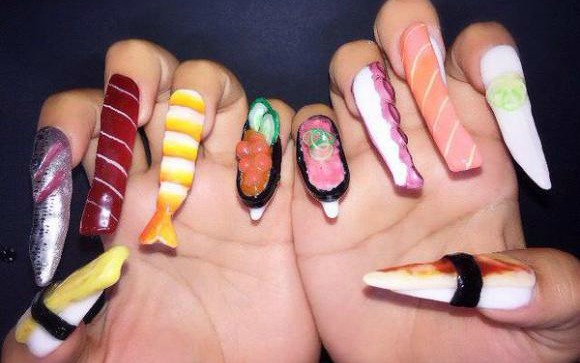 Sushi Nails: What Will Japan Come Up With Next? ‘Spamusement’ Parks, vending-machine restaurants and Super Nintendo World…..just when we thought Japan couldn’t get any kookier or quirkier, we found out about the latest trend: sushi nail art. Egg roll pinkie fingers? Now we’ve seen it all. Japan seems to love anything and everything “kawaii” meaning cute, and after the initial judgement subsides, we kind of love the idea of getting a sushi manicure. Some of the posts on Instagram and Twitter have been re-shared tens of thousands of times in a matter of days. If you thought this was kooky, you’ll love the Japan’s Spamusement Park, their vending machine restaurants, and the Super Nintendo World coming before the Tokyo Olympics!